Tiny details about Deepika Padukone & Ranveer Singh's Bangalore Reception which made it a class apart! I remember the frenzy around me when Deepika and Ranveer decided to release a few of their wedding pictures. Everyone felt like that one kid who gets to eat an ice-cream after a prolonged diet! As we were soaking in the bliss of the couple’s Italy pictures, the Bangalore reception came along and we were the bamboozled kids again! Now a ticket to Bangalore and access to the reception is out of the question, but we dug deeper (get it, get it?) and found a trunk full of the details of the party! Our eavesdroppers have confirmed that everything we heard is shudh just like their pyaar! Dhula Dhulan Padhar Rahe Hai! The newly married love birds descended from a magnificent staircase, looking like the aristocrats that they are! With broad smiles on their faces, they charmed each and everyone present there. Hey Deepika, how did you manage to walk down the stairs with that pallu? I trip even in my pyjamas! Nevertheless, look how happy they are! Here they are... @deepikapadukone and @ranveersingh arrive at their Bengaluru reception. Is it even a Ranveer Singh entry if its not dhinchak?! Deepika is a bit too familiar with his funk maybe that is why she complied with Lamborghini by The Doorbeen ft. Ragini being their entry song. The ones who can afford it, can also use it for their entry! Which reminds be, is there a song on Nano or Scooty for the likes of us? For their Bangalore reception the couple chose eco friendly cutlery. Everything was made from sugarcane fibre! The invitations were e-invites btw. Thank you for settling up an example, DeepVeer! Although she was styled by Sabyasachi, Deepika wore a saree gifted to her by her mother from Angadi Galleria, Bangalore. 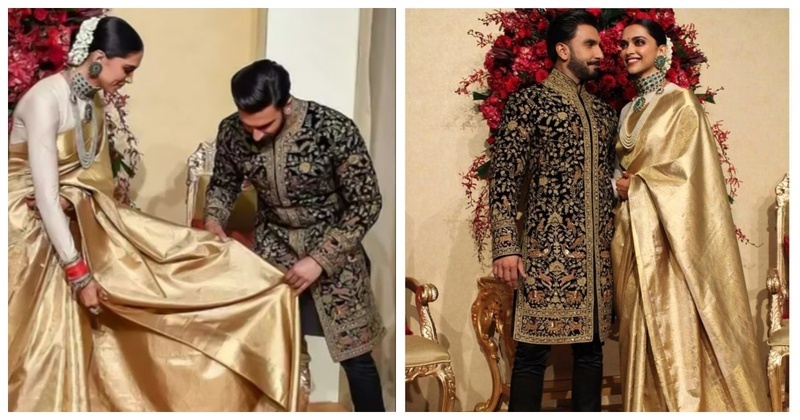 Ranveer was seen donning a Rohit Bal sherwani. Don’t worry, this time the due credits were given! Deepika’s pure zari gold silk kanjivaram had a looooong pallu! It’s a wonder how she didn’t trip in it. But guess who helped her maintain her calm? Her hubby, Ranveer Singh! He helped her to adjust her pallu whenever she needed! Whatte sweetpea! The Bhavnanis were twinning in all black at the reception! Giving tough competition to the royal family, don’t you think? Getting the Hansa (from Khichdi) vibes, anyone? In case you missed out on the beautiful pics from the reception, check out our blog here on what they wore and who all attended! Okay okay now stop bawling your lungs out. You’ll find your soulmate too, my child! And if not, you can always come back to this blog and cry!